So many downtowners have chosen the Coronado Historic District as our home (myself included) and those of us who have, are admittedly prejudiced about what a fabulous place it is. Home to 1920s Bungalows and 1940s Ranches, one of the larger city parks (Coronado Park at 12th Street & Palm Lane), and one of the most competitive and highly recognized high school programs in the metro area (the International Baccalaureate program at North High School), the Coronado neighborhood is a diverse place. The official District covers a bit more than a half square mile, but the homes on the edges (between 7th Street and 16th Street, McDowell to Thomas) are no less sweet and desirable. 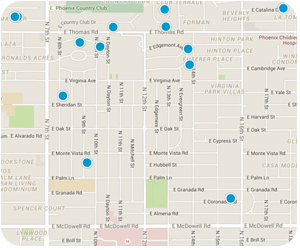 The additional area expands greater Coronado to about one square mile. Generally speaking, Coronado is known for smaller homes, usually (but certainly not always) with two bedrooms and one bath. Sometimes as small as 700 square feet, the average bungalow still has a small footprint averaging about 1000 square feet. Sustainable living at its best! More recently, however, remodeling of many of these smaller homes have included substantial additions that feature LUX master suites and open gourmet kitchens to spacious great rooms. 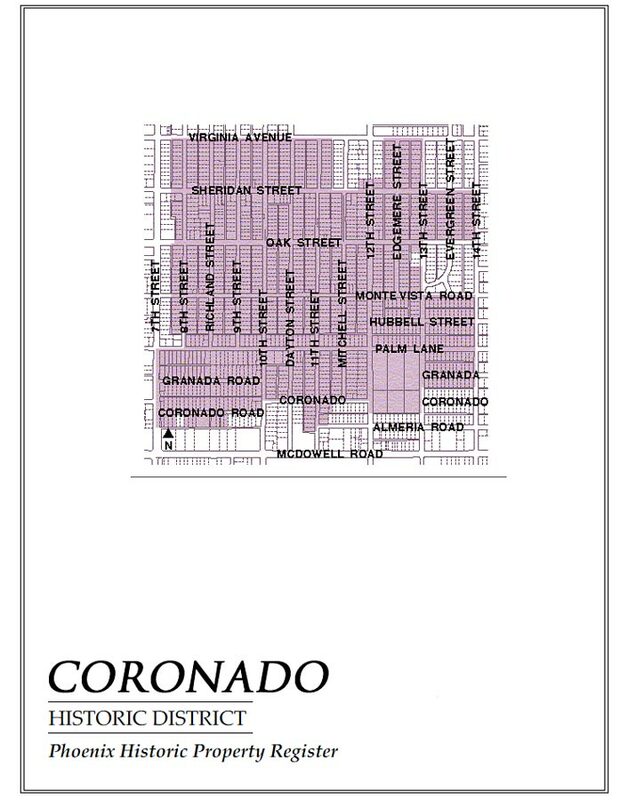 So, if you're a fan of this style - don't write the Coronado Historic District off. These remodels are coming in with some serious style, too! Some of the more popular designers in the area, like Joel Contreras, have labeled the Coronado Historic District a "favorite neighborhood" for his projects, and as a result there are some gorgeous blends of historic and modern to be seen. The wide porches, possibly the first thing you’ll notice, add shady outdoor space for family, friends and neighbors to gather and may be one reason why everyone in Coronado seems to know each other. Ample backyards provide private space and lend to the diversity of the place too—possibly home to a permaculture garden, or perhaps a guest house, a flock of chickens, or a state-of-the-art addition that quietly hides behind a traditional Territorial in front. There is often more to Coronado than meets the eye. And then there are the things that some very active neighbors manage to accomplish—like the Virginia street calming project (between 7th and 12th streets), the blooming traffic circle (12th & Oak), the metal logo “banners” that welcome you to the neighborhood on most streets, the Coronado Community Garden (1211 E Virginia)… we could go on and on! The most recent accomplishment was a face lift for the tiny Virginia pocket park (Virginia &15th Street). Maureen claims (without any actual statistics to validate her claim) that Coronado has the highest per capita population of architects and artists in Phoenix. The 8-block evening stroll with her dog Abby passes the homes of at least 8 architects plus the studios of nationally-renowned painter Ed Mell and woodworker Kevin Irvin. Yes, the homes in Coronado are charming and the neighbors are a friendly and creative bunch, but you'll also love the restaurant choices often within walking distance from your front porch. From The Main Ingredient on 7th Street to Tuck Shop and Duza's Kitchen at 12th & Oak (must try Tuck's house-made Gin & Tonic). And then there’s the amazing salsa array at La Santisima Gourmet Taco Shop on 16th Street and—need we even mention?–the 5-star Barrio Café just south of Thomas on 16th too. There are so many choices, and the food is SO GOOD!